A 75-kg man stands on his toes by exerting an upward force through the Achilles tendon, as in Figure 9.43. (a) What is the force in the Achilles tendon if he stands on one foot? (b) Calculate the force at the pivot of the simplified lever system shown—that force is representative of forces in the ankle joint. Figure 9.43 The muscles in the back of the leg pull the Achilles tendon when one stands on one's toes. A simplified lever system is shown. This is College Physics Answers with Shaun Dychko. The torque due to the force on the Achilles tendon has to equal the torque due to the normal force applied upwards on the ball of the foot. The torque due to the Achilles tendon is the force on the Achilles tendon times its lever arm, and that equals the force normal multiplied by the normal forces lever arm. We're conveniently given these perpendicular distances here. 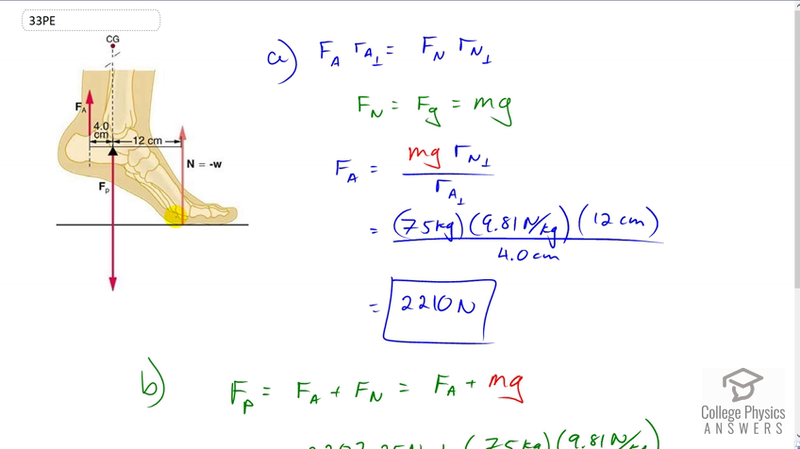 So we can substitute m g in place of F n because since that person is standing on one foot their entire weight is being supported by the floor. We'll substitute m g in for F n here and we've also divided both sides by the lever arm perpendicular of the Achilles tendon. So it's going to be m g r n perpendicular over r a perpendicular. So that's 75 kilograms times 9.81 Newtons per kilogram times 12 centimeters divided by four centimeters. We're leaving the units just in centimeters for convenience because they're going to cancel anyway and the only important thing is that their units are the same. This works out to 2210 Newtons. Then the question is what is the force on this pivot in this ankle joint? The force downwards on that is going to equal the total forces upwards of which there are two. There is F a on the Achilles tendon and the normal force. Then we'll substitute m g in for F n and we get 2207.25 Newtons force on the Achilles tendon plus 75 kilograms time 9.81. That makes 2940 Newtons downwards on the ankle joint.